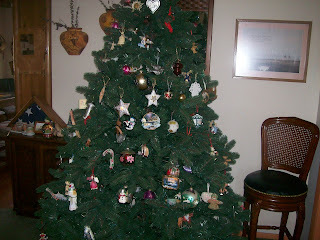 I so love our Christmas tree and all the ornaments Skipp has bought me over 20+ years. Each one has such meaning and beauty and purpose. The white shell with the two red flowers was from my nephew Clayton and his wife Gatey. They made them for all of us. It was their only Christmas together as husband and wife - he died the following November after only a year and a half married. They were an ideal couple in so many ways. Clayton is truly missed. My manger is priceless. It was our family's manger when I was growing up. If you look closely you can see the small angel candle and the small choir boy candle leaning up against the manger - they were my Grandma's and are over 100 years old!! Oh how I love family heirlooms and traditions. Did I thank all of you for your loving support and understanding during my recent low spirited mood? Well, "thank you"!! 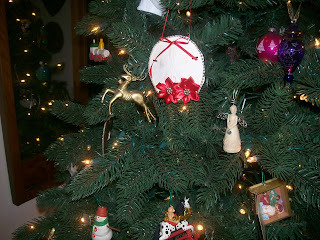 Great blog...and what treasures you have on and under your tree, Gail! Merry Christmas to you and Skipp...and know that you have a friend in me. Oh, I love your tree and your Nativity scene, and I especially love the sentiments and the love attached to and wrapped up in it all. So glad you had your nephew for awhile, and so sad for your loss. And I have so much admiration for the joy and gratitude you have in spite of trials, and for the joy you spread to others. You're one of the good ones, Gail. Thanks Gail for sharing, this is truly beautiful! 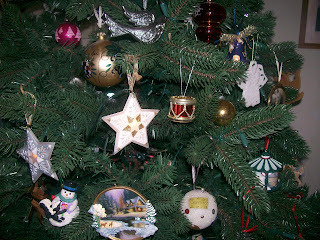 Enjoyed your photos and the music...I had one of the angel candles that we put out each Christmas when I was young. During the time my parents possessions had to be stored the candles sadly melted! 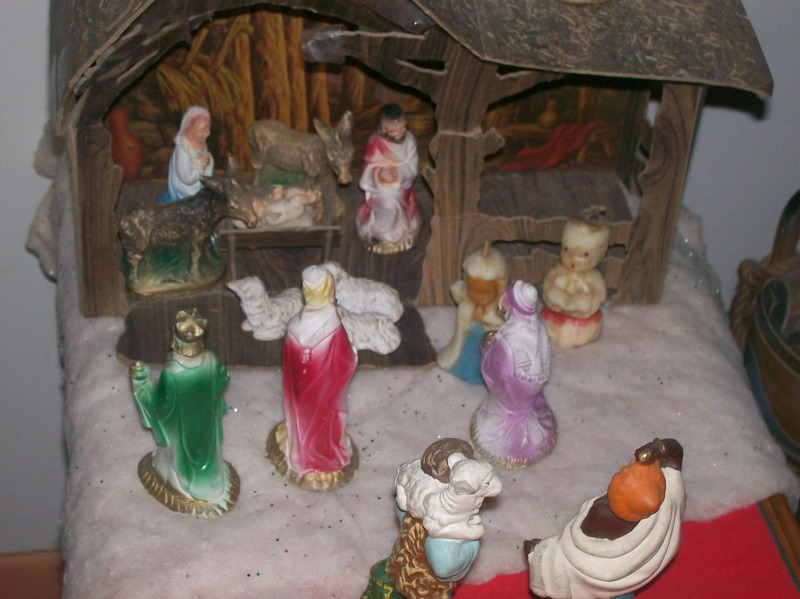 Your manger scene is beautiful! Merry Christmas, Gail. I hope your day is filled with Joy! @TRACEY - Oh yes!! I love that idea - I too am so happy to be your friend and holding hands as we walk into the New Year is a definite. Thanks so much for a ll your kindness. @THEANNE - sorry your Gram's candlemelted :-( I love that I have these old trinkets from my Gram and childhood. I also play the old vinyl albums we used to play - I love the scratchy sound and textures. So glad you came by. @ANNE - ...and a very Merry Christmas to you and yours. Gail, Sadly, I was not one who was "here" for you during your recent dark days. 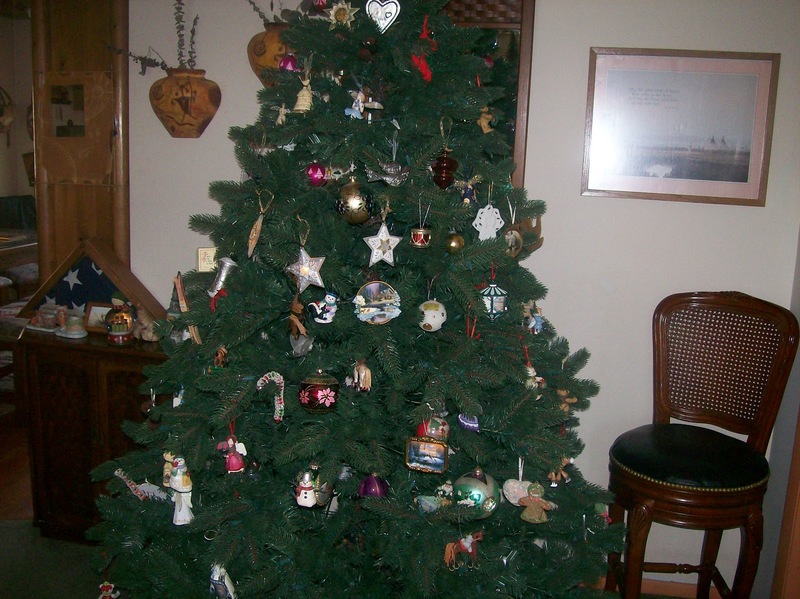 Your tree is beautiful & (as you obviously know) you are blessed to have the candles from your grandmother! Thank you is the best! Thank YOU for all you share here Gail. Hope you feel all the appreciation coming your way as a result of all the kindness and love you share. May your holidays and new year be filled with love and light. Amen, tomorrow is another day. That is what we hope for each day. Thank you Gail for sharing. Blessings. love all your ornaments and that you cherish them so much, so sorry you have been feeling down and where was your friend from Canada for you...hey. sorry sweetie. I got your beautiful card today. thank you so much. love you much, big hugs. HI CINNER - so glad the card arrived :-) and I feel you with je, always Love you girl "hey"
I think that manger may be identical to the one we had in my home as a kid. It sure looks it. I don't know whether I still have that in the stuff I brought from Mom's attic after she died or not—but you're so right about the value of those little family keepsakes and treasures. They are priceless! I hope you're back up and in the groove, getting all excited and geared-up for Christmas. We're going to leave here in a few minutes to go grocery shopping and to a couple of stores to pick up a few additional—small—presents. Then, back home to an evening of hearthfire and good snacky type of food. Hey sweet Gail, blessings to you dear one. May you have a wonderful day full of love, peace and Joy! And may the New year bring you many blessings! Beautiful post and pics, Gail. Stopping by to wish you the best of holiday seasons. May peace and love guide your path always. thanks for being ever so present. HI KIM - so nice to have you visit. :-) Our Christmas was filled with miracles of the simplest kind :-). I went over to your place - great new header design. Gail, your tree is lovely and the Nativity Set is beautiful. I hope you have a wonderful New Year my friend. Just popping into your blog from JBR's. This post is lovely and I hope you had a wonderful Christmas. I quite enjoy that song you posted and listening to it again brought me back many years! Happy New Year to you! Hi Gail, A lovely post :) Your manger is darling and you are so fortunate to have it, I don't have any Christmas heirlooms from my childhood. My sister has the only one - a little elf made from an egg carton that my brother made 40 years ago, which she hangs on her tree every year! I really appreciated the thoughts you shared on my New Year's post - beautifully expressed and I agree, in actuality there are no true clean slates - for any of us. It's a nice thought though and I always feel a surge of positivity and hopeful expectation as we enter a new year. trekking your blog!!! thanks for sharing and keep posting! Happy New Year!